Award winning chef, Asab Miah, takes great pride in his cooking and has brought together a superb menu combining traditional and modern dishes using only authentic spices from Bangladesh, complemented by a carefully chosen wine list. The restaurant has been recently refurbished with a bright, modern décor and a relaxed ambience - experience dishes you would have found back in the days of the Raj served by caring experienced staff under the management of Sabbir, son of owner Mr Hannan (formerly of the renowned Eastern Eye restaurant). 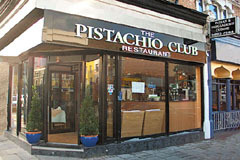 Our vision at Pistachio Club is to offer authentic Indian and Bangladeshi cuisine in a contemporary environment, served by experienced and caring staff. We sincerely hope that we meet your expections. We would welcome your comments and suggestions. We hope you enjoy our new and exciting menu.